Well I have been trying to do one of these for about 12 months. I have made a video, which wouldn't upload, I made a PDF, which I changed to a PNG & it wouldn't upload. I tried individual pictures & there were too many, so it wouldn't upload lol. Now I have taken a group picture, which is an epic fail, as I am crap with a camera, but I am going to post it anyway. The PDF/PNG had descriptions under the watches, but here is just a picture & a list. There is no direction anymore with the group, there was in the past, but now it is just watches I like. Left to Right, ATG MB1.5, ATG S2 Special, 1973 Heuer Monaco, 1996 Tag Heuer 1500 (The start of this madness), 1991 Rolex Daytona, 1983 Rolex Seadweller 16660, 1996 Rolex Explorer, 1971 Zenith Defy El-Primero, 1969 Omega Seamaster 200 (Banana), 1974 Spaceman, 1974 Omega Seamaster 600 Ploprof, 1974 Omega Megaquartz Stardust, 1998 Breitling Old Navitimer II, 1990 Patek Philippe Ellipse & Series 1 Peter Speake-Marin with 18k red gold Engraved dial & stainless steel case with matching engraved bridge, special organised by our host here Al (Cheers mate), many of these are not many peoples cup of tea, but that is why this hobby is so interesting, Mark. Let's see yours!!! Last edited by Spark; 31-03-2018 at 19:02. That banana Seamaster is...bananas! Very nice! Your like me you just buy what you like. I don't concentrate on certain brands just a mismatch of watches and I buy what I like. But do concentrate on vintage and military. Did ad my first new watch in years the Hamilton remake military issued hand winder with out date. Got most of the same stuff except for the Hamilton and a vintage Omega birth year watch that's on it's way so really not much change in my collection. 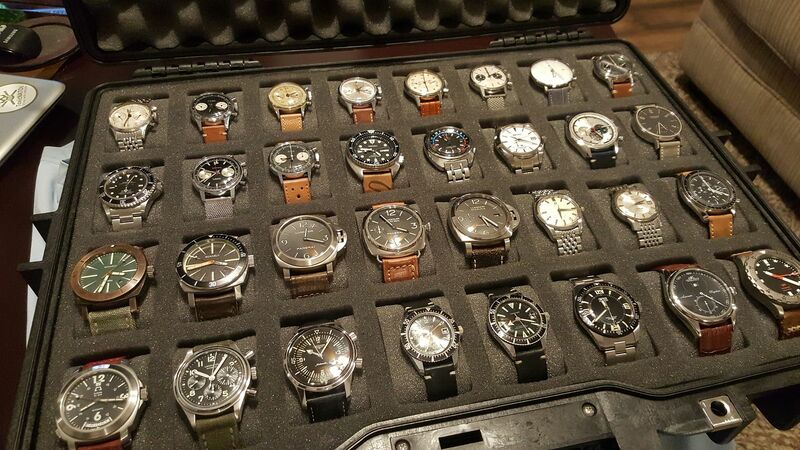 Like your Zenith chronograph and Rolex Sub nice collection. Last edited by river rat; 09-04-2018 at 18:06. It is great if you can focus a collection, but I found I got bored with many similar watches & decided variety is the spice of life. It is eclectic or just plain random, but I do try to keep to vintage where possible until a piece comes along that has a specific interest for me. For example being around here & having the opportunity to buy one of the early Bremont LE's in the MB1.5 although Bremont LE's seem to be less limited than some of their mainstream models now. The ATG S2 Special was another & the watch is the first one made, prototype/test watch that Al had, makes it very interesting to me. The PSM is another, in that Peter is English & I have been lucky enough to have met him a couple of times, the watch is hand made & has some unique features making it a Piece Unique in all but name. I will never be able to afford a Roger Smith or a Daniels, so this fits the bill for me. Nobody else fancy chipping in with their group shot?? First change of the year & hopefully the last loss. The Blue Old Navitimer II has sadly gone to part cover this beauty. Here's mine all together for a GTG last week. Way to many, I paired way down & now it's built right back up.